Five-hour San Marcos mobile home SWAT standoff over murdered turtle...and alleged terroristic threats. Around 10:30 a.m. Saturday, a 27-year-old San Marcos man touched off a touchy incident at Rancho Vallecitos Mobile Estates, 3535 Linda Vista Dr., San Marcos. First, he killed his mother’s turtle. Then, he threatened to kill his mother. Nearby homes were evacuated during a five hour standoff ended by the San Marcos Sheriffs SWAT Team with tear gas. Turtle killing suspect David Nelson, 27, of San Marcos. 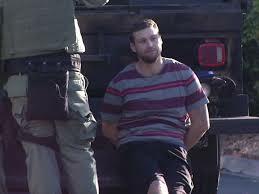 After about a five hour standoff with the San Marcos Sheriff’s SWAT Team took suspect David Nelson into custody shortly after 3:30 p.m. Deputies used flash grenades, then had to throw tear gas into the mobile home in order to take Nelson. His mother was unharmed. The mother was not identified by name, but was said to be in her 50s. They argued and Nelson threatened suicide by cops, according to sheriff’s Lt. Dave Schiller. After Nelson said he was going to become famous for killing people, his mother escaped the home and called 911, according to sheriff’s Sgt. Nanette McMasters. She said her son was high on drugs and killed her small pet turtle. Nelson told deputies they would have to shoot him, McMasters said. The SWAT team came on scene around 2 p.m., then threw tear gas canisters through Nelson’s bedroom window, officials said. Site map to turtle killing turned SWAT standoff. The turtle incident was just the latest for Nelson, whom authorities described as mentally disturbed. Authorities said he had caused disturbances in the past at the mobile home park. Nelson was being held on suspicion of making terrorist threats. Further information as available. This breaking news alert illustrated the new form of information aggregation techniques as word, and update, of the incident circulated through real-time social media. For more, visit http://ban.jo/News/US-Canada/20160116/Standoff-At-Mobile-Home-In-San-Marcos-CA-San-Marcos/. SDSO: SWAT standoff at San Marcos mobile home park ends peacefully after 5 hours. Suspect surrendered to officers. Pay attention San Marcos , Linda Vista Las Flores area SWAT is working the area, and you know how they are. Be the first to comment on "5-hour SD Sheriffs SWAT standoff starts with murdered turtle at San Marcos mobile home"